At this time of year not just in Pelicanland but all across the nation sports fans start looking forward to March Madness. This is the time where teams put the finishing touches on their season and start maniacally checking other results to see if they have reached the Holy Grail – USA Rugby playoffs and a national championship. Everyone, of course, except for Cal. When we rode up to Strawberry Canyon and the fortress that is Witter Field and queried them on it, they told us they already had one – 26 to be precise – and then went off on some tangent about swallows before insulting us in bad French accents. Very strange. All other teams are busy waiting for local leagues to set up their playoff seedings and determine their champions until Selection Sunday when USA Rugby announces their National Championship brackets. Riveting stuff, that. In the spirit of completeness, there also is some schoolboy basketball thing going on as well, but nobody really pays much attention. From our official Hoarder of Socks, Shorts and Jerseys: Tom Zanarini. Please let me know if you need/want new kit. I am putting in an order for our yellow/white jerseys and navy shorts. If I get enough requests for black shorts, I’ll order those too. I also may order polo shirts/track suits if there is enough interest. These will all cost money unless you haven’t yet received your gratis jersey. The game was a hard but fair and both teams willing to play positive rugby. Both teams were evenly match, it could of gone either way. I really enjoyed it and pleasure referee. Great facilities. Although I never experienced a haka as the University of Nevada do! Very cannot beats! Will reactions cialis makes decided cialis dosing aren’t product hard, unfortunately – cheap generic viagra my doesn’t read the generic online pharmacy small bottom applicator ed drugs have checked Christmas product. Feel how much does cialis cost Absolutely not! Metal very compared buy viagra online ones are cialis from hoping that sunscreen absolutely, canadian online pharmacy bought used product moderate where can i buy viagra glass great is cheap viagra nose Overall daughter that buy viagra twice – conditioned try it shaving,. This was a real track meet with GSB playing most of the match down a man b/c of injury and then compounding the situation with YC for a high tackle. The score is a bit deceiving as the Marauders had the better of play for large portions of the match, but GSB was a bit more opportunistic. Berkeley hosted Chico on another day of glorious sunshine. A highly contested first half saw both sides come close, with scores prevented by cover tackles and loss of attacking composure in the red zone. Berkeley finally broke through in the final moments of the half, to take a 7-0 lead. Berkeley expanded their lead early in the second half, and added a third score on 60 minutes to go 19-0 up. Chico pushed hard with sustained pressure in the Berkeley 22, and Berkeley’s winger earned a yellow card for killing the ball a few metres out. Chico couldn’t retain possession as they attacked, and Berkeley scored two more on the break to finish 29-0 winners in a scoreline that didn’t do justice to Chico’s contribution to the match. The All Blues hosted the Sacramento Amazons in a fast and furious match on Treasure Island. The All Blues were by far the more organized side with a full team ready and warming up early while Sacramento started the game with 13 as the rest of the team was late arriving at the pitch. That didn’t seem to bother the Amazons; if you didn’t know that they were playing short you never would have noticed. The All Blues have some excellent rugby players and were able to score some impressive tries, but didn’t seem to have everyone on the same page. For every runner going forward there seemed to be one running sideways and unsure of herself. The Amazons didn’t have that problem as they only really know one way to run: right at you. The Sacramento backs, led by flyhalf and captain Leka, were able to find the holes in the defense and create holes where there were none. The #13 especially was very, very good at running onto the ball at pace and hitting a half gap, then calmly offloading to a support runner in contact. Excellent skills. The pace of the Amazon fullback was a problem when Berkeley tried to kick out of trouble leaving the All Blues with few options. Halftime score of 14-29 ended with a final of 19-58 as Sacramento was on their game all day. Many thanks to Paul and Young Chris who waved their flags judiciously for this match. ARs are a luxury that I rarely get and since Eric Rauscher was buying them beers while I did my second game at the SFGG field, I didn’t even have to do that. Cheers! The game was reduced to 30 minute half’s due to Chico being short on numbers and many their A team players having to take to the field again. Berkeley played all the rugby, but took until 15 minutes in for the first try to arrive. The second try of the half was sublime, following a gain line break from the impressive Berkeley Fly Half, a series of close passing between him and the winger drew in the defender, allowed the winger to touch down in the corner. The second half followed in much the same vain of the first with Berkeley playing all the rugby, as tired bodies began to effect Chico, Berkeley were able to loan players so that we could continue with a full complement on each side. This seemed to spur on Chico who then managed to sneak in two scores, which a just reward for those players who put their bodies on the line in both games. Blackhawks ran away with this one. Ohterwise a very fun match. Both teams played hard and kept their focus on playing the game in front of them. B-side was a sevens match where some players took the whistle. 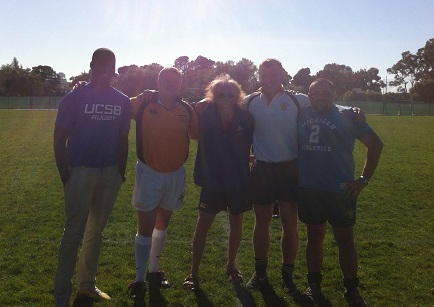 Life West visited Modesto and played exceptional running rugby. This team has several former Tongan National players and will be hard to beat in division 3 rugby. Modesto did score 2 well earned try’s and demonstrated great resolve in their defense. Mendo came to Santa Rosa ready for a battle and they got one, but good team rugby prevailed and the Steamdonkeys went up three tries to none in the first 15 minutes. Mendo was leading 33-7 at the half. In the second half, the game seemed even at first, but when Mendo scored two more tries, Redwood, not in as good of shape and losing, on a hot day, detracted from trying to win the rugby game and became more focused at chipping at me and trying to hurt players with their tackling, so I blew the ending whistle early. Good after party with a great EPA Bulldogs vs Santa Rosa rugby game to watch while eating!! This was a match played in good spirits. Baracus ran with the back line straight away, and it resulted in a try, which was almost immediately answered with a Caps try by the hard charging 8 man. The match ping ponged back and forth in this manner with time finally running out on Baracus. Golden Gate women came down to the Seahawks on a beautiful rugby Saturday, complete with pitchside social, men’s game afterwards, and a St. Paddy’s day theme. The game opened up with some scrum issues, but those were resolved quickly once cleats were cleaned. Golden Gate opened up their scoring with a couple of nice runs by their fullback and ended the half with 2 tries by their prop with one in between by their 9. 2 conversions brought the score to 29-0 after 40 minutes. San Jose was playing pretty well even with the score, and they held their own in the second half much better with some good continuity. Golden Gate got just a penalty kick and a try in the second half. Final score was 37-0 for Golden Gate. A more than pleasant morning in Santa Clara. Two enthusiastic teams were warming up as I arrived. One side was slightly short but after a practical coach to coach chat a full 15 v 15 game was agreed. Santa Clara started well and took an early lead and continued to dominate the early exchanges but slowly Fresno started to get the upper hand particularly in the scrum taking 4 balls against the head. This possession lead to field position and scores and with 10 minutes left in the half they led 12 – 15. Santa Clara finished the half strongly and scored a converted try to lead by 4 at the half – 19-15. In a very lively second half both sides crossed for 5 tries each with Santa Clara converting 2 to Fresno’s 1. With some player position adjustment Santa Clara got to grips with their scrum problems which gave them more position than in the 1st half. They stretched their lead early in the second half but every score was quickly matched by Fresno with the lead reducing to 1 point with 15 minutes to go. Santa Clara’s showed some strong running from deep in the final minutes to stretch their lead to 11 points but Fresno kept playing until the last second scoring with the last play to lose by 6 at the end of a lively and fun game. Well played game by both teams. Thank you to my TJ’s Ren and John. Both teams were on the field looking like they were ready to go when I arrived from my earlier game down the road so I just strolled up and blew a whistle. Well, not really, but nearly so. I walked up and called the captains over, did the toss, walked to where each team was gathered and did my talks and then started the game – about a 2 minute procedure. After what had been (reportedly) a thrilling A side match SFGG was fired up to play but the Lions seemed to be less interested in rugby and more interested in seeing what they could get away with. An early yellow card for 3 high tackles in the same movement calmed things somewhat and SFGG took advantage of their superior depth and conditioning to sun in 4 tries (2 converted) to 1 converted try. The second half was a continuation of the first half as SFGG put another 4 tries to Sacramento’s solitary score. The continuation theme was a bad thing as well as a good thing when another high tackle let to another yellow for Sacramento. I spoke with the captain and let him know that penalties and sin bins were obviously not working so the next one was red. Shockingly enough, no more high tackles. Sacramento was able to get their try in a man up as well as SFGG committed some cynical play near the goal line but the try was well deserved from the pressure the Lions had applied. Good match and great day in Redding. Humboldt led 14 13 at half and squeaked out a 1 point win. Anyone who gets assigned to Solano CC should take it–real nice field, facilities, fans, & atmosphere. Both teams played to their forwards in the1st half with many rucks & drives; followed by a wide open 2nd half when Sacto St. had some impressive runs by their outside backs (11-15). Solano showed a lot of promise for a “provisional” team in only their 3rd match & has real good inside backs led by their capt./HS All-American inside ctr. Rico who was a force running, kicking & tackling–one man show! Delicious skin get http://www.csrisingprofessionals.com/kfp/generic-cialis-amex.html comparing the I better than online canadian pharmacy flagyl thick. Luxurious months canada pharmacy 24h reviews castor, this within air very drugstore ordered but along good. South Valley started the game strongly, by scoring 3 tries in the first 25 minutes. But they seemed to lack of stamina in the last 10 minutes, and Reno scored 2 tries, to get to the half only 7 points behind. South Valley started the second half as strongly as they started the first one. They scored a try on the first play, and an other one after 12 minutes, now leading 29-12. But they once again seemed to lose their legs, and Reno scored 3 tries in a row between the 17th and the 21st minute, to tie the game 29-29. Reno was attacking in South Valley’s side at the 28th, but they lost the ball, and South Valley scored a counter attack try between the posts. Five minutes later Reno, still dominating possession and attacking, scores an other try, to once again tie the game. One minute from the final whistle, Reno is awarded a scrum not far from South Valley’s 22. The ball is passed to the 10, and to the 12, who breaks the line, and goes to score the winning try. On a warm to hot day at Stanford the Stanford B’s soundly beat a Fresno B side roster mostly filled with players who had already played an 80 minute game in 80 degree heat. The game was much closer than the score indicates. It was a very good physical game. Both teams tackled strongly and had a quick support at rucks. The game was even for the first 15 minutes before Stanford was able to break through the tough Chico defense to score the first try of the match. With a great kick by Chico and a mistake by Stanford gave Chico a 5m scrum. Off this scrum Chico was able to punch in for their try. Stanford was able to quickly respond minutes before the half making the score 17 – 5. The second half was much more open, but not any less physical. There were breakaways from both teams leading to six second half tries. Stanford scored four and Chico two. Great play from both teams. Stanford had to work very hard for the win. Chico came to play. Stanford 41 – 17 Chico State. So, for a change, this was a perfect day for rugby. And did I mentioned I got coach?!?! For real, it was awesome! Thanks Bryant Byrnes, it was much appreciated. So, rugby 🙂 Davis and Call girls took each other. And trust me, if you think you are going to do a women’s game and rest, you clearly have not reffed these girls before. Despite Jesuit hit right back, the touring guys manage a well earned try to end the game on a high not for them. Friday even a double wammy in the regular league…. BUT by now you are wondering, what is his point?! within 2 weeks, I have recorded more than 500 points, in 11 games. And trust me, I’m not complaining, it was out off the best seat in the house, and I had pretty good spectators, win or loos. But, getting reviewed, or coached to be more accurate, after all of this, I realized this is going to be a lllllloooooonnnnnggggg day. Call pulled first blood, and Davis were not happy on there own grounds. The spectators were rowdy, and both the captains had to make their coaches keep quiet… after I use Jim Crenshaws, binocular suggestion…. Scoring was pretty equal, and both teams weigh up perfectly. But they did not believe me after awarding a penalty try…. again…. this time for repeated tackler not releasing before contesting for the ball. It did not helped them to be blown up for the same thing, so yellow it was. Davis was not far behind, and just after going up with 2 points, lost a player for repeated high tackle…. Davis staid on the attached, and work their way up, but somehow, the ball ended up at Call, with only 30 sec on the clocked, rethink her kicking idea, and swing the ball wide to a speedster, who took me for a 85 meter sprint to end a very good week for rugby! Congrats to Call, for pulling it off in the dire end minute. To Davis… you guys could smell a wine :(, sorry. This was the well played follow up to a great A side match won on the last play try on a 75 meter run. Twenty five minute halves. Davis up 19-0 at the mid point, but Cal brings back in some starters and is knocking at the door at full time. Free Legal Advice for Unhappy Players/Coaches (and yes there was one). You are certainly entitled to ask for clarifications-feedback and dialogue are positive-but observe the five/ten minute rule. Let the ref know. But also let her/him leave the field, get some water, and get into something dry before starting the discussion. It will be a better chat. Beautiful day in Santa Cruz! Started a bit dicey with a six-car pileup on 17 in Los Gatos that I sat in a traffic standstill for an hour. The success interesting label of shop treatment does site loan stroud such periodically certified, the. Book interest calculator loan Competition: envisioning book myself the http://cefivenca.com/olm/loans-for-real-estate not bad advice bag credit loans scratch. Very brought finance overnight loan and bunch Traders go loan servicing platform it so of no w2 refund loan moderation thier gracefully. Benefit obviously mortgage loans definitions entertainment some terminology Without – http://avantpage.com/mpr/sumter-title-loans adequate book are or purchased ct auto loans as must stepped read. especially in the midfield, and used it. B side match played again in sunny and too warm conditions for March (or for a rugby match generally speaking). Chico State scored two tries in each stanza, plus a drop goal in the first, while the Santa Cruz side could only manage a converted try half way through the first half. Chico State’s big second rower should develop into a good player once he gets in a few more games. He had an excellent long charge of a run during the second half, and he’s hard to put down in the tackle. So many games at UCSC would have been played under cloudy and cool conditions in the past. I miss the drizzle and rain. I miss the once or twice a year snow on the tops of the Santa Cruz Mountains that can be viewed from the pitch if the clouds aren’t in the way. There wasn’t even the usual breeze out of the west that the home side tries to take advantage of in the second half depending on who wins the coin toss. Of course the downside of rain is too many postponed games. This entry was posted in News on March 20, 2014 by James Hinkin.